The United States suffered great loss of life in hurricane Katrina 2005 and in the Galveston hurricane of 1900. 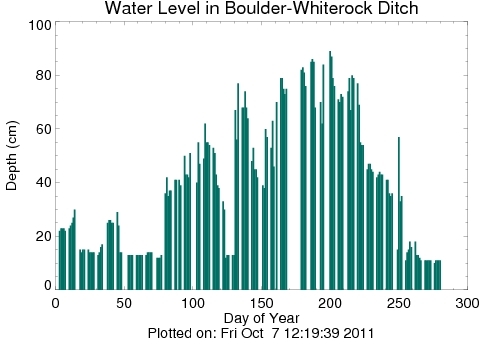 NCAR has sophisticated models and powerful computers that can forecast these events before they happen. 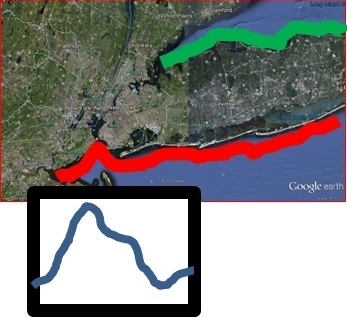 A web-based system for predicting storm surge could save lives in vulnerable coastal areas. 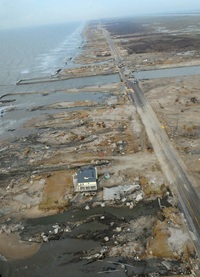 When hurricane Ike hit Gilchrist, Texas in 2008, the destruction was nearly total. NCAR's WRF model can simulate a hurricane. ROMS can simulate storm surge. When coupled together, these two models can provide a forecast of flooding in low-lying coastal areas. It is technically possible to build a web-based system that will provide real-time forecasts of sea levels as a hurricane makes landfall. The project is also a nice introduction to data collection, graphing, and display over the Internet. I created the graph above with IDL and used a simple Linux shell script to transfer it to the web server. Boulder - Whiterock Ditch begins at Broadway and Canyon in Boulder as a spur canal off Boulder Creek. One can go inner-tubing from there all the way to Mitchell Lane during high water, but the low bridges are dangerous. The canal runs by Hayden Lake, but does not normally drain into the lake unless a certain gate is open. Boulder and Whiterock Ditch eventually runs through Gunbarrel and Niwot all the way out to Panama Reservoir Number 1. During 2002-2004 I identified and named the highest lake in the United States: Pacific Tarn at 13,420 feet near Breckenridge, Colorado. You can read all about it at highestlake.com. The picture below shows me standing on the summit of Pacific Peak at dawn on July 14, 2002 during the CHAOS scientific expedition to the lake. Pacific Tarn and Quandary Peak are behind me. I maintain a web page on hurricane metrics with an emphasis on separating the ACE index into its components. 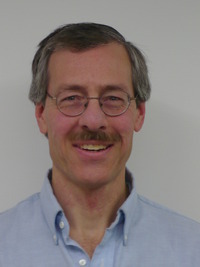 I contribute to a personal blog, funmurphys.com, that sometimes contains posts of scientific interest. Funmurphys: The Blog is independent of and not endorsed by NCAR.